The 1960s and 70s was a period when the alarmists reigned supreme. It was the time of The Limits to Growth, peak-oil, peak-food, peak-resources, peak-water and the coming doom of the earth. Not one of their catastrophe scenarios has come to pass or shows any signs of coming to pass. The fear-mongering by alarmists about the catastrophic effects of the population explosion has been one of the most shameful examples of the prostitution of science by individual academics (like Paul Ehrlich) and cowardly institutions looking for sensational copy. The fear-mongering of the 1960s and 1970s has continued through the 80s and 90s and beyond, but now about climate and bio-diversity and mass extinction and the ozone-hole and GM crops. These catastrophe scenarios will also gradually die out as it becomes apparent that they are just the ravings of those who make a living out of spreading alarm. The alarms are unjustifiable, but untestable, and each tends to take about 3 decades to burn itself out. Within 50 years the world will be dealing with the challenges posed by the consequences of an ongoing population implosion in developed parts of the world (which will then include India and China) and the total world population will be in decline by 2100. The cold, relentless hand of demographics is inexorable and the decline is already visible in many countries. 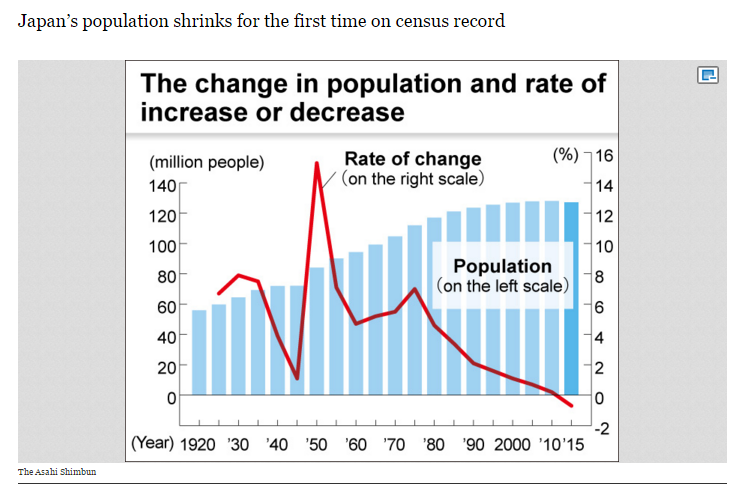 The future decline in Japan’s population has been recognised as inevitable for over 20 years and social engineering has not succeeded in reversing the inevitable. Now Japan has entered negative territory for the first time since the 1920s — entirely as expected. In due course the fear-mongers will moan about the coming death of the species due to the population implosion, but this too shall pass. After about 100 years of a slow population decline I expect we shall see a new equilibrium for population and birth-rate, where longevity, fertility measures, incentives and a bright new world of genetic screening will be part of the mix. By 2200, a form of non-coercive eugenics will no longer be a dirty word, but will instead seem eminently common-sensical. This entry was posted on February 26, 2016 at 8:29 pm and is filed under Alarmism, Demographics, Japan. You can follow any responses to this entry through the RSS 2.0 feed. Both comments and pings are currently closed.